Following my hasty wrap-up of Final Fantasy VIII last week I took a few days off from the Road to XV in ’15 for a few days, owing to other commitments and obligations in my life. Now I’m just a handful of days into Final Fantasy IX, and I’m about to shove off for four weeks on a month-long holiday, meaning I will not be finishing the game until August. The marathon will pause while I’m gone, which means there won’t be any live-tweeting during this time, but there may just end up being a couple intermission pieces going up during July to fill the gaps (Advent Children or The Spirits Within reviews, anyone?). No promises or anything, but keep your eyes peeled each week for something new just in case. Now then. Final Fantasy IX. The timing of this piece really couldn’t be better, as Final Fantasy IX celebrated its 15th anniversary this week, having released July 2, 2000. It is the final game in the series to release on the first PlayStation, and just like Final Fantasy III on the NES and Final Fantasy VI on the SNES before it, Final Fantasy IX pushes the boundaries of what is capable on the then dying hardware and looks just lovely compared to FFVII and FFVIII. There are others that would vehemently argue that fact (not opinion) due to the cartoony, semi-deformed nature of the character models, which are drastically different from the imitated realism of its PlayStation predecessors. All it takes, however, is a wander around the world at large to see just how much more detail there is in the world of FFIX than the two before it. Final Fantasy VIII’s cutscenes were definitely a bold step forward from FFVII, but FFIX again takes it to the next level. Even to the day the world is so incredibly charming and lovely to look it. Sure, it looks old, but noticeably less old than VII and VIII. As fans of the series may know, Final Fantasy IX is possibly the greatest culmination of every title to come before it. Up until this point each game has taken select elements, characters, enemies, and the like from prior entries and built upon them in different ways. While each Final Fantasy tells a new and exciting story, the glue that holds them together and makes them feel familiar are the constants such as Cid, chocobos and moogles, Shiva and Bahamut, and the use of magic. Final Fantasy IX is different though. That is to say, it does all of these things as well, but it’s a whole different ball park. Final Fantasy IX feels less like a love note to the PlayStation era and more a love note to the entire series. The darker, more serious tones prevalent in FFVIII, FFVII, and even FFVI take a backseat here, opting instead for a more whimsical, charming, and fantastical setting. Black, Red, and White Mages all return in proper roles. Non-human characters such as hippo- and rat-people wander the streets of Alexandria and Lindblum, and in fact nearly half of the main playable cast are non-human. There’s Vivi the Black Mage, Quina the Qu, and Freya the Burmecian (a kind of anthropomorphic rat). Final Fantasy VII and Final Fantasy VIII feel like they could happen in the real world, but Final Fantasy IX truly returns to the series’ fantastic roots. Another aspect that blends old with new are battles. 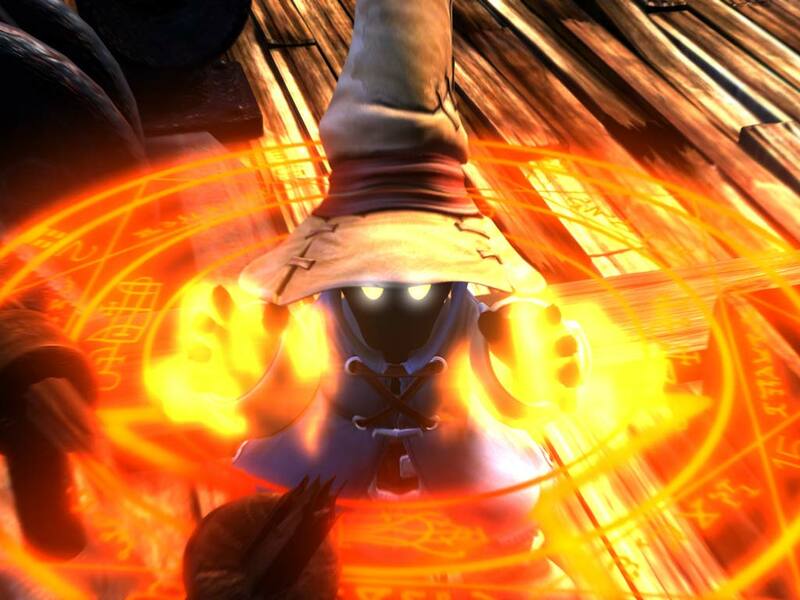 FFIX returns to having a maximum party of four like in each of the first six games save for FFIV, but retains a more modern feel, including special limit break-type abilities called Trance. It also pulls from FFVIII’s junction system in clever ways, and indeed feels like Junction 2.0. Instead of junctioning summons (that anyone can use) that learn specific abilities, each character has specific weapon and armor types that are compatible with them. Each weapon and piece of armor comes with up to three moves that can be used so long as that item is equipped. Then once you have earned enough AP through battles to learn that ability, you’ve got it for good and can upgrade to better gear with better abilities. Adding more depth to this mechanic is the brand new synthesis system. Synthesizing has become somewhat of a series mainstay in some shape or form since, and it really started here. By going to a synthesis shop in the world you can take two of your older, weaker weapons and upgrade them to something new and powerful. Of course you need specific items to result in the desired upgrade, but that is to be expected. 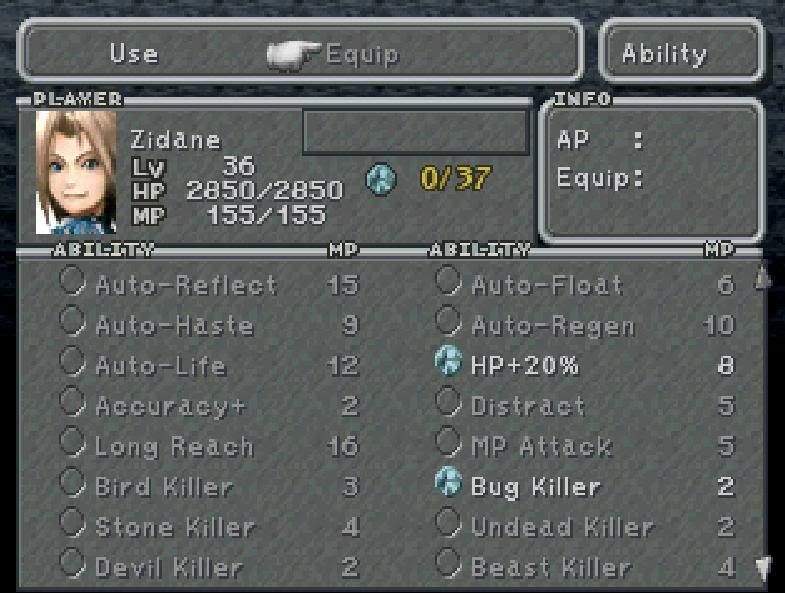 I have heard a lot of uncertainty from fans of Final Fantasy IX, claiming one of the weakest parts of the game is the ability/weapon/upgrade mechanic, but personally I’ve got no issues with it. Oftentimes you’ll find a stronger weapon before you’ve fully learned all the abilities of the weaker weapon, and you’ve got to strategically think about which you want more: better attack power or to learn that skill. It makes the game more dynamic. Really I’ve only got two complaints so far, and they both have to do with game speed. First of all, battles feel much, much slower than anything prior. Even with the battle speed maxed out in the menu settings, it still takes an awfully unnecessarily long time for the ATB gauge to fill up, making the fights feel so long and drawn out. This particularly bugs me in such a fun and entertaining game, especially when half the game is spend in battles. The other annoyance is load times. Each town, cave, or random destination features some half a dozen or so screens that you travel between, and each one has a load time ranging from approximately 4 to 8 seconds. It doesn’t sound like a lot, but when you’re playing the game it just feels sluggish. I mentioned before that Final Fantasy IX pushes the PlayStation’s capabilities to its limits, and perhaps the load times are a direct result of how intensive the game is. Still, paired with the slow battles it becomes so difficult to stay “in” the game, if that makes sense. Regardless of load times, I’m still having an absolute blast re-discovering this game. There’s plenty more to say on the game regarding some of the individual characters and how great they are, but I’ll save that for a later date. I’m only 6 hours or so into Final Fantasy IX at this point, and won’t have much more opportunity to play it before leaving on my holiday, but it will be a lovely game to come home to at and get back into. On that note, I’ll be back in August! Remember to watch this space for potential surprises in the coming weeks too!